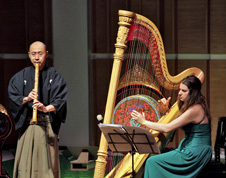 Music From Japan celebrated its 35th anniversary with Sukeyasu Shiba and his gagaku ensemble, Reigakusha. For this special program Reigakusha performed original and reconstructed works by Mr. Shiba along with a brand new MFJ commission, Mai Fu Jin 35, composed by Mr. Shiba in honor of Music From Japan’s 35th anniversary. The program also featured newly commissioned dance segments to excerpts from Mr. Shiba’s epic, Shotorashion. 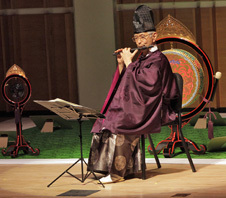 Festival 2010 opened on February 20 at Merkin Hall in New York City with Sukeyasu Shiba’s Gagaku Universe. 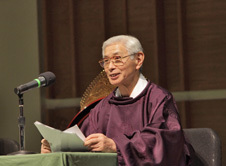 In a preconcert lecture, Mr. Shiba gave a history of Gagaku music. One of the world’s foremost scholars on the subject, Mr. Shiba described the evolution of the music and gave a demonstration on the biwa. The second half of the concert began with a quartet of haisho, gaku-so, genkan and o-hichiriki performing a reconstruction of Chosa Join, one of 25 manuscripts for biwa found in cave 17 of the 1000 Buddhist caves at Dun Huang in Western China. Shotorashion closed the program and served as a fitting finale. A work for full gagaku ensemble that featured three new dance segments commissioned by Music From Japan, the piece showcased Reigakusha’s intensity alongside its beauty: the modern dance was choreographed and performed by Stephen Pier, while the mikomai dance was choreographed and performed by Maya Sakai. After the concert, Music From Japan hosted a reception upstairs for the performers, composers and tomodachi (friends) of Music From Japan. 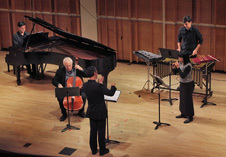 The second concert Highlights of MFJ Commissions II, given at Merkin Hall on February 21, focused on past commissions by Music From Japan, as well as two new commissions for the occasion. 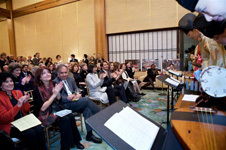 Works by Hikaru Hayashi, Shin-ichiro Ikebe, and Sunao Isaji were revived, and new commissions by Hitomi Kaneko and Yasuko Yamaguchi were premiered by Mayumi Miyata, Hitomi Nakamura and Music From Japan Chamber Ensemble, which comprised pianist Stephen Gosling, cellist Fred Sherry, percussionist Eric Poland, the Cassatt String Quartet and conductor Yasuaki Itakura. 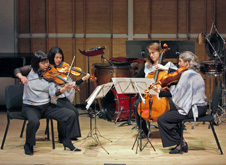 The program began with Hikaru Hiyashi’s Lament, performed by the Cassatt Quartet. The ensemble deftly navigated this work, at once thorny and lush. For the next two pieces, MFJ was lucky enough to have the original ensembles that premiered the works. 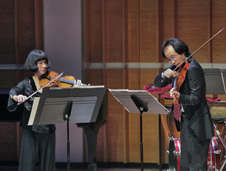 Eriko Sato and Tom Chiu played Shin-Ichiro Ikebe’s Bivalence for violin duo. Exhibiting great virtuosity, they gave a thrilling performance of this extremely fast-paced and challenging piece. Sunao Isaji’s a lovely day for mirrages on the sea for flute, violin, cello, piano and percussion and conductor closed the first half of the concert. With an almost surreal quality, the work seemed to hover with an imaginary feeling, intoning non-existent languages and rituals. 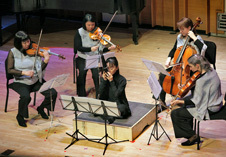 The second half of the program featured the two works commissioned by MFJ for this year’s festival. The first, Hitomi Kaneko’s Almost Dusk for string quartet and sho, was steeped in timbral variation, exploring first the overtones of the string instruments, then the sho, and finally the two together. Closing the concert, Yasuko Yamaguchi’s Wurzeln, for hichiriki, cello, percussion, piano and conductor, a work in which dashing fragments and glissandi stream into one another and break apart, in a flowing expansion and contraction of sound and melody. 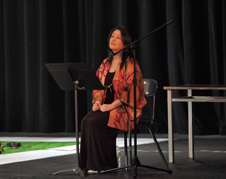 On Monday, February 22, Music From Japan presented a special children’s program at the Hunter College Elementary School, featuring Reigakusha. The children were introduced to gagaku music with a brief history and a performance of Ponta and the Thunder God, based on the retelling of an old folk tale by Sayumi Kawauchi and set to music by Sukeyasu Shiba. With echoes of “Jack and the Beanstalk”, Ponta tells of a boy whose eggplant seedling produces a plant so huge that he can climb it to reach a mansion beyond the clouds. The students also sang a “shoga”, an oral notation system that is sung to aid in the memorization of melodies. 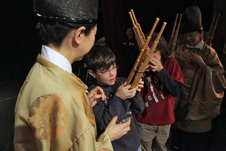 After the concert portion of the program, students learned about the gagaku instruments and several children had the chance to try them out. Wrapping up its 35th anniversary season, Music From Japan took Reigakusha to Washington DC for a repeat performance of Saturday’s program. Despite the copious amounts of snow still on the ground, the ensemble played to a sold-out audience at the Smithsonian’s Freer Gallery.